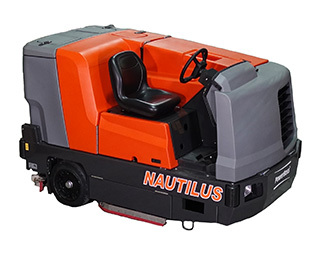 The NAUTILUS scrubber sweeper can be an exceptional value to your company. Large water capacities provides longer cleaning time, heavy duty stainless steel parts offer lower cost of ownership and the unmatched maneuverability helps to ensure professional cleaning results that will make the difference for you. 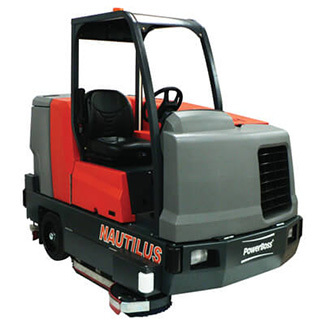 After removing the engine panels, no tools required, this provides 360 degree accessibility around the engine, radiator, hydraulic pump, vacuum motor, hydraulic tank and the electrical system. This provides the opportunity to keep the machine maintained properly. The easiest task can be difficult if things are in the way. 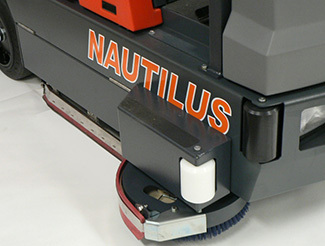 The operator can turn around in a 9’ aisle if needed without having to back up or turn off the water or brushes while scrubbing. The operator can READ the traffic and REACT safely. Utilizing only one switch, the operator can have all functions turn on and off with a flip of one switch. The functions (scrub and/or vacuum) are selected prior to cleaning. The Green Quick Scrub master switch turns the selected functions on and off. Individual functions can be adjusted by the operator during the cleaning process. 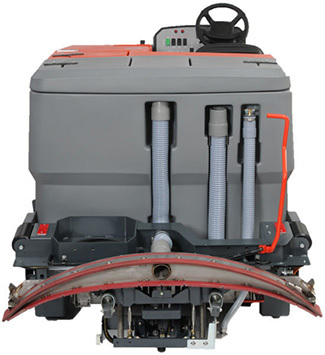 The operator can change water flow and brush pressure on the move. Two powerful Eaton hydraulic motors turn two 45” cylindrical brushes at 425 RPM. Choose 200, 300 or 400 lbs of down pressure using the selector knob on the operator control panel. Rip the build-up off the floor or bring the polish back to the high gloss finish. 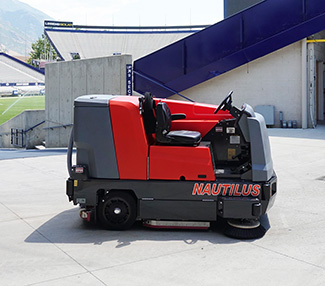 11,500 CFM vacuum completely dries the floor allowing forklift or foot traffic to travel safely behind the machine. A large drain hose provides quick and clean draining of the dirty water. Two large doors at the top of the tank and one 8” access cap provide easy access for washing the recovery tank free of sediment.